Frikkadel Review 2019: Is Frikkadel a Good Hosting? I signed up to Frikkadel, reviewed their unique features, tested how easy they are to use, checked with support on several issues, and tested the speed of the live site. When done, I tried to cancel my account and receive a refund. This is my experience with Frikkadel - I hope you can learn from it. Frikkadel is a South African hosting company. There’s minimal information available online about the company itself, which is a little unusual, and the no-frills website is provided in English, with some of the site content and navigational buttons available in 25 other languages. The shared hosting plans include two cPanel plans, one for South Africa and one for Europe and the U.S. Apart from the price being cheaper for the EU/U.S. plan (oddly), the only difference between the plans is the server location. 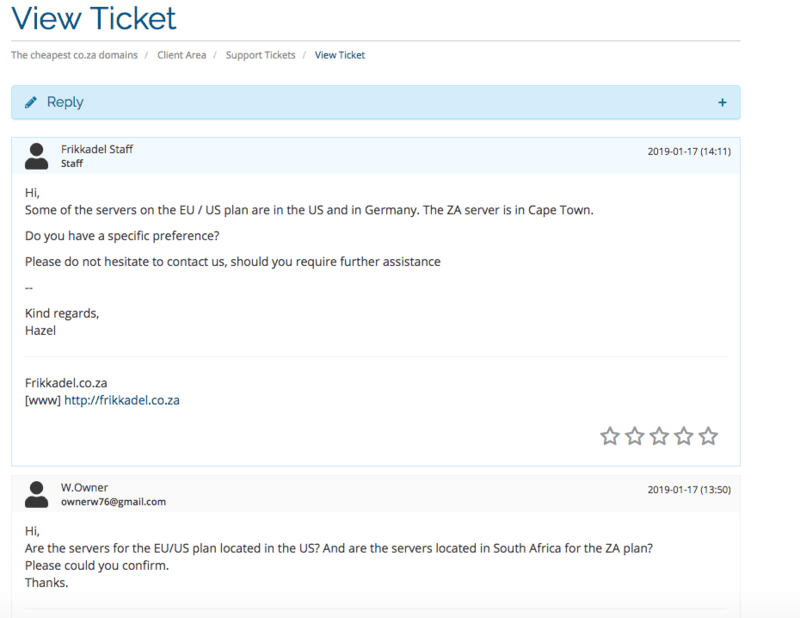 After confirming with support, I can tell you that EU / U.S. plans are hosted in the U.S. and Germany, while the ZA server is in Cape Town, South Africa. These plans both come with cPanel, which is an easy to use and reliable control panel, and a premium installation of Softaculous with more than 400 programs included. There are also unlimited FTP accounts, but no support for PHP or other advanced coding scripts. If you’re looking for an unlimited plan, the Web Hosting plans comes with every resource you could imagine in unlimited quotas e.g., unlimited disk space, monthly bandwidth, FTP accounts, email accounts, email lists, databases, subdomains, parked domains, and add-on domains. There are also a couple of beginner-friendly features including free website templates, a paid website building tool (if you buy the tool, you get free hosting), and Softaculous one-click installer. However, as with the cPanel plans, there are no expert level features (aside from FTP access). Unfortunately, there isn’t an uptime guarantee for shared hosting (there is for the dedicated servers), and I have found some negative online reviews about excessive downtime. Considering the simplicity of this website, there are a surprising number of services provided by Frikkadel including shared hosting, reseller hosting, and dedicated servers. Lower-tier resource allocations are generous, but the higher-priced unlimited package is on the pricier end of the spectrum, considering the level of features. Wondering how Frikkadel stacks up against other Web Hosting companies? Enter any other Web Hosting company and we will give you a side-by-side comparison.